At some point, while in college or high school, you may be assigned to write a compare and contrast essay. The first thing that will be helpful in doing this is to know the differences between a compare essay and contrast essay. A compare essay explains how two items are different, while a contrast essay explains the emphasized differences rather than the similarities. In a compare and contrast essay you will both be emphasizing and explaining the differences, as well as similarities on your topic. After understanding exactly what your paper should be about the first thing to do is choose a topic. The best topics to use are objects that are really similar yet at the same time completely different. A few examples would be, Crocodile and Turtle, DVD and Blu Ray, Printer and Fax machine. Each of these items are very similar to the one it is paired with, however there are many notable differences. By putting those well-known facts down you see immediately that the turtle and crocodile are both reptiles that are able to swim. There are a few questions one must ask themselves while they write a compare and contrast paper. By asking these questions and understanding what you're supposed to write about, you will be able to create an excellent compare and contrast essay. Does your professor want you to compare and contrast, or do they only want you to do one of those things? Some professors only want you to compare the differences on two things while others want you to focus on the similarities as well. Understand what your professor wants before writing, as a compare or contrast essay can be quite different from a compare and contrast essay. Are these two things really different in at least one way? In order to truly write a successful compare and contrast essay one must avoid focusing on differences that are blatantly obvious or well known. For example, it is obvious that the turtle is much smaller than the crocodile. Try researching for facts that are not well known that emphasizes the difference between them. How well do I know my topic? 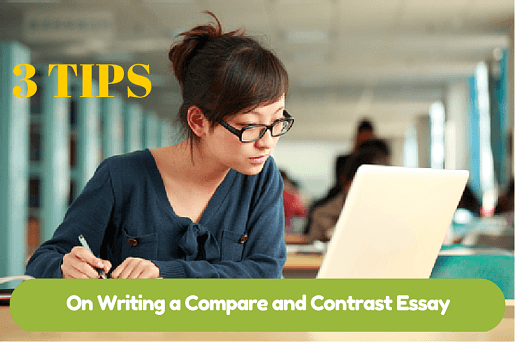 In order to successfully write a compare and contrast essay one must know if they know the topic well enough to discuss it for a certain length of time. Be sure to select a topic in which you are able to comfortably write about and already know some of the facts on the subject. Knowing the differences between comparing and contrasting is the first step in writing a great compare and contrast essay. You must also have some knowledge as to what you are talking about and of course be prepared to talk about and explain it. Always remember that if you need help writing any kind of an essay, there are many writers at AssignmentMounatin who would love to come to your aid.